A short tour of the UK and Europe followed the release of their 2nd album "Organisation" in the Autumn of 1980 and this soundboard recording is taken from that tour. The crowd were so enthusiastic that night the band were forced to come back on for a second encore - and as Andy McCluskey had to admit, had run out of material, so several songs were played twice! Its a great performance; a great gig by a band still in the early stages of their career. The soundboard recording needed a bit of work - being over 30 years old - but has polished up well and responded to some remastering. I hope you agree; this one certainly proved popular with many OMD fans. 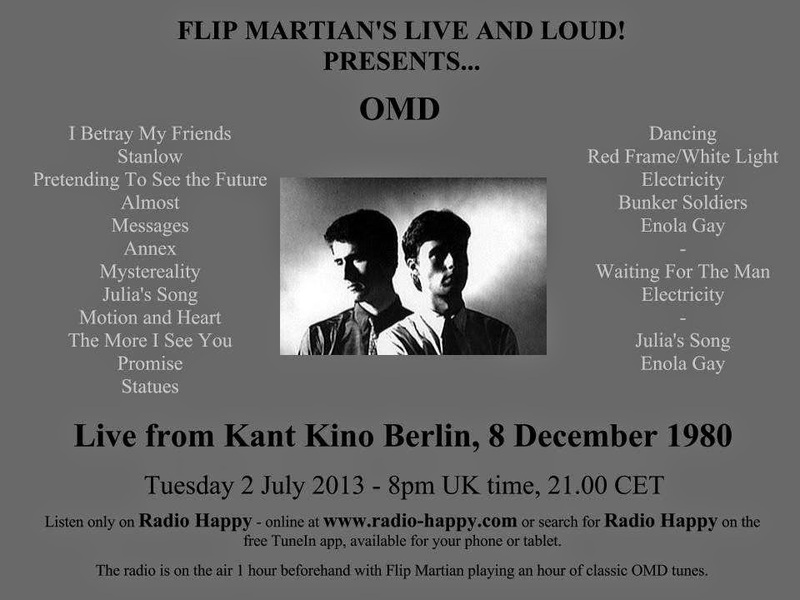 Many thanks for this early OMD show. Nice job, and an excellent show! Many thanks for all your hard work with this site. Unfortunately this upload has been deleted, is there any chance you could re-upload it please ? Thanks for letting me know - looks like the host has deleted a few files but impossible to tell from my end, which! I'll go through all the links this week and replace any broken ones - should have it sorted out by the weekend. Cheers for that - all now reinstated.